You probably are used to my exhortations and admonishments about creating great compost and brewing a healthful concoction from it. Compost tea is great for your plants’ immune systems, adds beneficial microbes to the soil, and is part of a well-rounded organic gardening regime. Today, however, I’m going to suggest another kind of tea: a soothing and warming selection of herbal teas to reward you after your gardening chores. Right in your garden may be some herbs that you grow for seasoning your special dishes. Some of them lend themselves to refreshing or restorative beverages. Try lemony lemon thyme, lemon basil, or lemon balm alone or in combination. A lovely citrusy flavor can also be extracted from leaves of beebalm (Monarda didyma). Also known as Oswego tea, this plant was used by American Indians long before white settlers arrived in the northeastern North America where it is native. Although it is covered with fine hairs and may not look very appetizing, borage (Borago officinalis) leaves make can be used for tea. Its flavor is somewhat reminiscent of cucumber and is reputed to give one a boost after a hard day. The star-like blue flowers can be added to glasses of iced tea as a delicious and delightful garnish. All of the types of mint may be used for tea. There may be more than you are aware of. 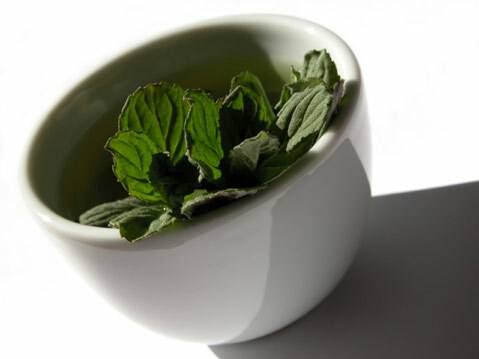 The most common is peppermint (Mentha X piperita) and has a very deeply minty flavor. Spearmint (M. spicata) is a little sweeter and lighter, while apple mint (M. suaveolens) adds a hint of apple essence. Its variegated form is known as pineapple mint and mimics that fruity, tropical flavor. As a general rule, steep about one teaspoon of dried leaves or about half that amount in each cup of boiling water. If you like, add one or more of these to black or green tea for a change. All the herbs mentioned, with the sole exception of borage, are perennials and not only last for years, but will benefit by occasional pinching for the tea pot.